Mexican Dried Hibiscus Flowers. 100gm. 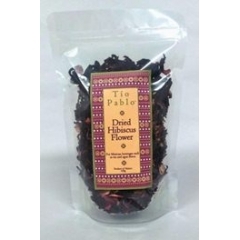 Home > Spices > Mexican Dried Hibiscus Flowers. 100gm. "Jamaica" in Spanish. Most commonly used as tea or in aguas frescas (sweetened, cold drink). Due to it's medicinal properties, some people call Hibiscus the "other cranberry". As a matter of fact, it's good to soothe colds, open blocked nose, clearing up mucous, as an astringent, promoting proper kidney function, helps digestion, a tonic, a diuretic and helps reduce fever. It is also very rich in vitamin C.